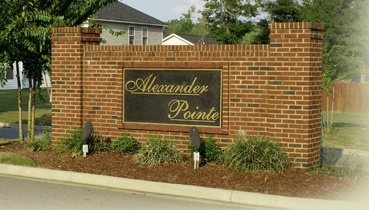 Alexander Pointe is a Premier Series neighborhood, located in Southeast Columbia, SC, featuring one and two-story plans starting in the low $110's. The information center for Alexander Point is at the Kingston Ridge community with a furnished model to tour. Visit today to see the newest that Essex Homes has to offer! Alexander Pointe homes range in size from 1,200 to over 2,800 square feet and offer three, four, five, and six bedrooms. Features include 3 inch baseboards, designer made cabinets, 6 panel door with hinges and knobs, and 2 car garages with openers. The Alexander Pointe community is convenient to shopping, dining, and interstate.